When the railways were built in the United States in the 1800s some of the steel for the tracks came from iron works in Maesteg, south Wales. If US Republican presidential candidate Mitt Romney makes it all the way to the White House then the town will have helped to forge the next First Lady as well. Ann Romney's father Edward Davies emigrated to America with his parents from Caerau, a small village just up the Llynfi Valley from Maesteg. Mrs Romney has been showing off her heritage by treating campaigners and journalists to Welsh cakes on her husband's campaign bus. Her father was born into a coal mining family in 1915 when most men in Caerau worked underground. Local historian Cyril Phillips said the village was founded on mining which became the main employer in the valley after the iron works at Maesteg closed down. "A lot of the tracks used to build the railways in America came from Maesteg," he said. "The iron works closed and people went to work in the mines." It is believed from the 1911 Census that Mrs Romney's grandfather, David Thomas Davies, lived at Victoria Street in the village. The tightly packed terraced houses still stand today. It is just a stone's throw from Noddfa Chapel and Mr Phillips said religion would have played a huge role in the lives of people in the village. "The miners did not usually work on Sundays," he said. "It was a very strong Christian area. On a Sunday you would see people walking to chapel or church right through the valley as obviously there were no cars or buses." During the 1920s and 1930s the collieries started to close. Mr Phillips said: "Quite a number of people left the area because the work was no longer there. "Some went to England but also all over the world. A lot went abroad to America and Australia." The Davies family headed for America and settled in Bloomfield Hills, Michigan, where Mrs Romney was raised. Few in Caerau are aware of the village's links to the Republican presidential candidacy race unfolding on the other side of the Atlantic. Local county councillor Ken Hunt said it was not an area where Republican policies would find much support. "I'm an independent but it is very much Labour," he said. "It is an area of high deprivation. The last coal mines shut in the 1980s. Most industry has gone. The biggest employer is the bakery in Nantyffyllon. "But it's not all doom and gloom. A lot of landscaping has been done to repair the scarring [of the land] from mining and the iron works. "The valley is recovering well. Like everywhere else it is jobs that we need." After winning the Iowa caucuses on Tuesday Mr Romney is seen as the front runner in the race to secure the Republican Party nomination. 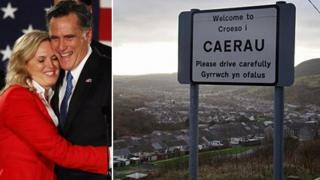 Mr Hunt said Mrs Romney would be welcome to visit Caerau whether she was First Lady or not.